Area 51 R2 with x99 Motherboard: CPU Upgrade options? I've had my Area 51 R2 for around 3 years now, over time I've upgraded the SSD (128gb to 512gb), RAM (16gb to 64gb), also added 3 more HDDs, fairly standard stuff. It currently has the stock CPU it came with Core i7 5930K, and I'm now thinking of upgrading my CPU. My basic searching leads me to believe that to move up to the Core i9, I'd need to get an x299 motherboard, and whatnot, and this may be technically challenging to do on my own. What options are there to upgrade my CPU that can work with the x99 board already there? 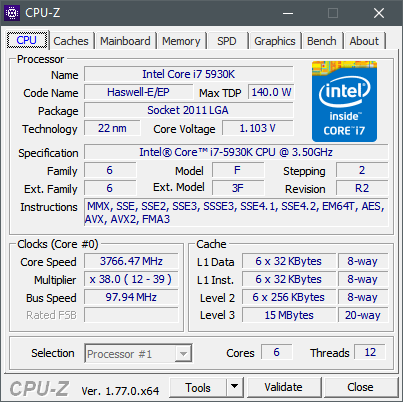 Is the 5930k the best I can get for the x99 board, or is it possible to switch to Ryzen etc? The PC is mainly for dev and database work, so it does lots of database queries (long running), compiling etc. It also works as my plex server. I game a bit, though not as much as I used to. Hi. It's been a while since I upgraded my CPU/Mobo but it looks like you can put up to an i7-6950X CPU in your mobo which should have an LGA2011-V3 socket. You may need a BIOS flash to help with forward compatibility. This is a serious CPU and it will still hold up with the latest ones very well especially with some overclocking. They aren't cheap though so maybe another i7-6XXX series CPU would be a better option. Upgrading your mobo isn't as hard as you may think. I put an aftermarket mobo in my old Aurora R4 without any issues but I can't say how the newer machines go with non-alienware boards. You may lose some functionality. This might the best (read easiest) route to take. I may go for the 6950K, seeing as the price is over half that of the 6950X. Would it work with the stock bios firmware? As my PC is my daily driver, I'm very wary of risking a motherboard swap without a thread/guide of someone who has done the same thing. For now I think I'll start looking into getting the 6950, as this is the path of least resistance. Sorry, no, that's not me. I only started thinking about this upgrade in December 2018. I don't mind losing the side panel lighting as I don't even use them, they've been OFF for months now. If I was 100% certain that if I bought motherboard X, and CPU Y that it will work without much hassle, I would attempt it. But as I stated in the previous reply, I'm very wary of breaking my daily driver PC with no backup to fall back to. I'll take the chicken route for now and try a 69xx processor. Thanks for your advice though, much appreciated. Couldn’t tell you if your BIOS would work sorry. Since the CPU is compatible to the socket then I would assume that it will be fine but I don’t know a whole lot about that range of processors. Updating the BIOS isn’t usually a big deal anyway. It seems scary but I’ve done it countless times on many computers and never had an issue. It’s up to you though. Just remember to install previous versions first in order. Seems it will, I have the A14 version, which, according to this guy on YT, should accept the 6950 with no issues.